The Terry Scholars are pleased to welcome some amazingly accomplished individuals to start our first ever Leadership Speaker Series. Our hope is that the students who attend will be enriched as they fine tune their leadership and networking skills as leaders on campus. 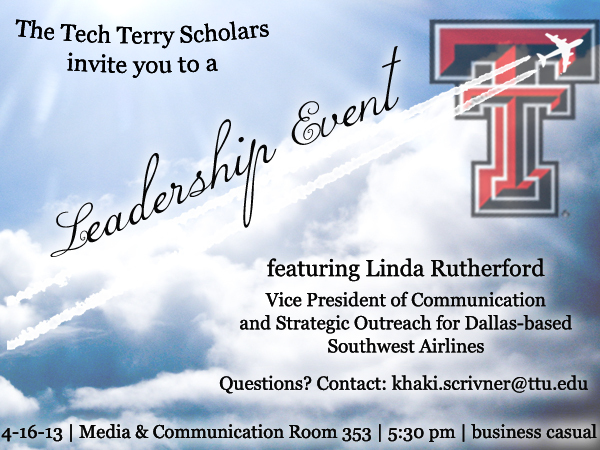 The Tech Terry Scholars are hosting a Leadership Series. Our first event is September 11th at 7:00 p.m. in the Human Sciences Building Room 169. The speaker is Chancellor Hance. Afterwards, refreshments will be available to encourage networking among Tech's most ambitious students. The goal of the Series is to feature distinguished guest speakers throughout the year. Participants will have the opportunity to learn from amazing leaders and network with some of Tech's most ambitious students. We would like to extend an invitation to you because you exemplify the qualities we seek to uphold. The Tech Terry Scholars are an organization comprised of students receiving full scholarships from the Terry Foundation in Houston, Texas. We strive to promote leadership, community service, and academic success. We would be honored if you attended our event. 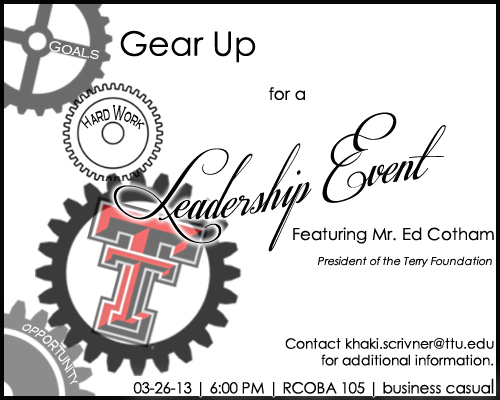 If you can attend, please wear business casual and RSVP to Khaki Scrivner at khaki.scrivner@ttu.edu by September 5th.